A plague of locusts swept through Egypt a few weeks ago, an estimated 30 million of the critters. Egyptian officials tried to downplay the phenomenon, hoping to quash any biblical analogies. But more earthly indicators suggest that the blighted Egyptian government is in such deep political and economic trouble that perhaps the analogy is apt. Experts and senior government officials worldwide are warning that Egypt’s economy is hurtling toward collapse. Almost every day the street war pitting the Islamic government and its allies against the secular urbanites seems to be growing angrier. 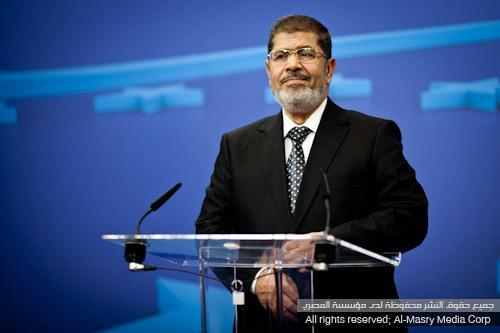 But the central problem behind all of this is Egypt’s president, Mohamed Morsi of the Muslim Brotherhood. The brotherhood hadn’t governed anything of consequence before Morsi took office — certainly not a fractious nation of more than 82 million people, the largest in the Arab world, with a $230 billion GDP. Morsi seems baffled as he relies on the nation’s foreign-currency reserves to keep the nation afloat. They’ve fallen from $35 billion to $11 billion in a matter of months as Morsi continues drawing from them just to pay the bills. The value of the Egyptian pound against the dollar is plummeting. Unemployment is creeping up toward 13 percent. Flour and sugar cost 50 percent more than a year ago while the price of common vegetables has doubled. Part of the reason: A severe shortage of imported diesel fuel is ricocheting through the economy. Diesel not only powers the nation’s commercial-transport truck fleet but also irrigation pumps used by millions of farmers to grow wheat and vegetables. The Luxor area, home to tombs of the pharaohs, is usually teeming with tourists. Now it’s reported to be a ghost town. Ninety percent of Luxor’s half-million people had worked in the tourist trade. Morsi made headlines worldwide this month when he ordered the arrest of television comedian Bassem Youssef, often compared to American TV comedian Jon Stewart. Youssef had made satirical jokes about Morsi on air. The arrest brought a sharp rebuke from Washington. And much of the commentary since then has made the point that Morsi seems to be more passionate about controlling public criticism than righting the wounded economy. In fact, Morsi’s government just issued arrest warrants for five bloggers and tweeters, accusing them of mocking Morsi online. Also drawing the world’s eyes is his government’s tacit approval of recurring attacks on Coptic Christians. Last week, several photos went viral showing the attack on Cairo’s St. Mark’s Cathedral this month in which four Christians were killed. In one grainy shot of the attack in progress, you can just make out the caps and helmets of several police officers, standing by and doing nothing. Morsi’s government said not a word about this or any of the other atrocities committed against Christians in recent months. In fact, Morsi holds himself blameless for all that’s going on. Last month, Moody’s Analytics downgraded Egypt’s bond rating, saying political instability has “significantly weakened” the economy. But Morsi’s government blames this, and everything, in fact, on his predecessor, Hosni Mubarak. Morsi even struck back at criticism from Washington over his arrest of Youssef, the TV satirist, and other negative foreign comments. Egypt, he warned, will deal “firmly” and “decisively” with any foreign attempts to interfere in his country’s affairs. In other words, any foreign official who dares to criticize him. How long can this irresponsible man be allowed to mismanage arguably the Middle East’s most important state? For the sake of Egyptians, religious and secular, let’s hope not much longer.